As a little girl, one of my favorite things to do when I went to visit my grandmother was wind the clock that sat over her fireplace. I remember the constant ticking as we would make cookies together. 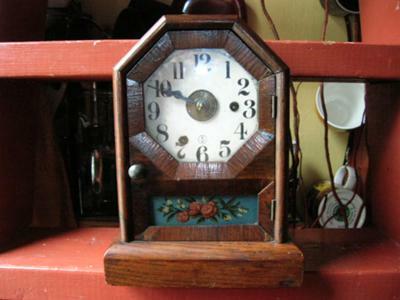 40 some odd years later I now have this clock and wind it daily and find a strange comfort in that ticking still. My question though is I really know nothing about it other than it was handed down to my grandmother by her mother. Now my grandmother was born in 1894 so I really have no other date to gage anything by. I have uploaded a picture but I have many more. I know it is a Seth Thomas but that is about it. Any additional info would be great.